AB 32 contains a load of energy policy changes and has garnered passionate supporters and opponents. What caused the United States to lose its lead in wind turbine manufacturing? Why did Japan take a lead in solar installations and manufacturing in the early years of this century? What factors were responsible for the German solar revolution in jobs and solar power production? How has China become a global force in solar manufacturing and wind power ? How did Spain become the leading solar market for a brief period? The answer is the same in all cases: policy, policy, policy. In the case of the U.S. and Spain -- bad energy policy or none at all. When it comes to energy, you can have boatloads of quantum dots and carbon nanotubes, billions of Bloom boxes and own a lithium mine -- but if policy is not in your favor, you're going nowhere. In the United States, at the federal level, we have Investment Tax Credits, a looming climate and energy bill, talk of a national Renewable Portfolio Standard (RPS), and billions in loan guarantees and grants from the stimulus bill. In California, there is a 20 percent RPS and a governor-ordained 33 percent RPS by 2030. In March, the California governor signed SB 71, creating a sales tax exemption for the purchase of greentech manufacturing equipment in California. Assembly Bill AB 510 was signed in February, which raised the net energy metering requirement from 2.5 percent to 5 percent, and the governor just signed SB 77 to establish the statewide Property Assessed Clean Energy Reserve Program to lower upfront costs for businesses and residences making home energy improvements. Bottom line: energy flow from traditional sources or new renewable sources pivots on policy. The event was held at the offices of the Mayfield Fund, a Menlo Park-based VC firm, and was organized by Pedram Mokrian, a Venture Fellow at the fund. This article focuses on the AB 32 part of the discussion. Although this is currently a California issue, there is a tendency for these things to spread to other states. Josh Becker focused on his support for AB 32, the California greenhouse gas law, and the efforts to overturn the bill. Last month, California Governor Arnold Schwarzenegger said that greedy Texas oil companies want to "verschmutzt the world" and are spending millions in California to roll back AB 32. Becker put the opposition's spending figure at $50 million. Becker said, "Only in California would we see two Texas oil companies trying to overturn seven years of planning on environmental legislation." Meg Whitman, eBay billionaire and Republican primary candidate for governor, proposes a one-year moratorium on AB 32. Whitman's position is as follows: "I believe the right thing to do is to take the time, as provided for in the law, to figure out how AB 32 will impact our economy. Then we can move ahead at a wise and deliberate pace to reduce our greenhouse emissions, without hurting our fragile economy. At the same time, we must support the development and export of clean technologies." She continues, "I believe we can meet many of AB 32’s goals by boosting our use of renewable energy, reducing our dependence on fossil fuels and removing existing regulatory barriers that are stalling clean-tech projects ready to go now. I am committed to making California the global leader in the use and development of clean technologies." The management committee for the campaign to support AB 32 includes Silicon Valley Leadership Group, E2, and Clean Economy Network on the cleantech side and EDF, CLCV, and NRDC on the environmental side. Other cleantech partners include NVCA, TechNet, the Energy Foundation and CalCEF. Another Republican contender in the California gubernatorial race, Steve Poizner, also wants to roll back the bill. Jerry Brown, the Democratic contender in the race, supports the bill. Here's a strong analysis of the race from FiveThirtyEight. Each side furnishes their own experts and data on the employment intensity of green jobs versus how AB 32 will banish jobs to other states and countries. Republicans Whitman and Steve Poizner have cited the discredited Varshney study on AB 32 in the past. There are as many data points on green job creation from AB 32 as there are on employment destruction from AB 32. The anti-AB 32 forces want to establish a trigger -- namely, a 5.5 percent unemployment rate -- as the signal to reestablish AB 32. 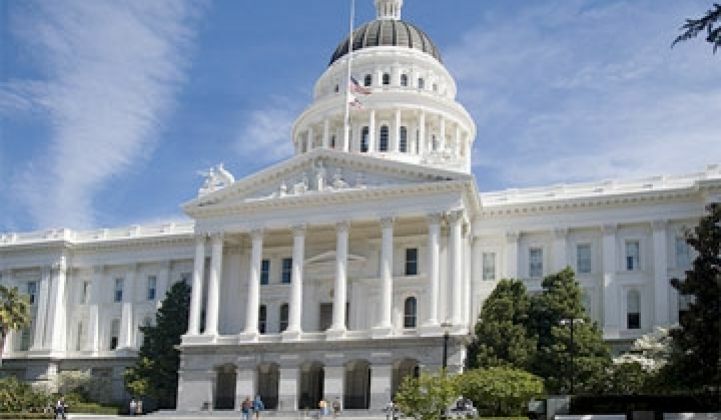 A report by the California's Legislative Analyst's Office cited by the Appeal-Democrat forecasts an impact on some parts of California's economy from AB 32, but finds the exact impact is hard to measure, and the overall impact on the economy will be modest. The report cites that AB 32 is a "go-it-alone" approach that would result in "economic leakage" to other states. Makes the Air Resources Board (ARB) responsible for monitoring and reducing GHG emissions. Continues the existing Climate Action Team to coordinate statewide efforts. Authorizes the governor to invoke a safety valve in the event of extraordinary circumstances, catastrophic events or the threat of significant economic harm, for up to 12 months at a time. The Solar Energy Industries Association just released an independent study projecting the positive economic impact of the Department of Treasury Grant Program and the Solar Manufacturing Investment Tax Credit. The study found that extending the TGP by two years and including solar manufacturing in the industry's existing tax credit would add 200,000 new domestic jobs to the solar workforce and supporting industries in the U.S. Additionally, it would result in 10 gigawatts of new solar installations by 2016. More than 100 contractors from across the U.S. are converging on Capitol Hill this week to meet with lawmakers and support the $6 billion Home Star Energy Retrofit legislation. Home Star is a national program intended to create jobs and turn around the construction industry, which has seen 25 percent unemployment in recent years, and boost manufacturing capacity, which is currently stalled at 62 percent. The proposal is expected to create 168,000 high-quality construction jobs over the next two years, and help homeowners dramatically reduce their home energy use.